Most of the lobster tails you will buy are from the spiny lobster species, ( A.K.A Rock lobster) there are over 40 different species of these in the world. These tails are commonly called either warm water or cold water tails, depending on where they come from. Warm water tails mainly come from Brazil, Florida, Cuba, Nicaragua or the Caribbean. While your cold water tails will come from Australia, New Zealand or South Africa. The main difference from spiny lobsters and American whole lobsters is that the spiny does not have any front claws. But they make up for it in their tails, which is about 33% of their body weight. Most spiny lobsters will average under 5 pounds and the size of the tails range from 5 oz to 22 oz. Cold water lobster tails are known for their firm, tender, sweet meat and the fact that they shrink less when you cook them. The raw meat of the tail will be almost translucent with tints of pink, cream or whitish gray. The actual tints of the tails mainly depends on where they are caught and what they have been eating. The shells on the cold water tails will be noticeably different, much more rougher than the warm water tails. 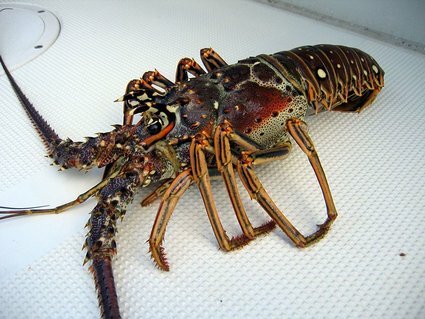 The picture below is of a warm water spiny lobster. Scientific name:panulirus spp., Jasus spp.